Featuring original mainsail insignias, letters and numbers, the Sea Bags Vintage Insignia Collection conjures up cawing gulls, salty white cap splashes and crisp ocean breezes reminiscent of bygone coastal summers. Added new weekly, our Vintage selections feature mainsail insignia logos from the sails that spent their life on the water. These vintage markings can range from numbers and letters to mainsail logos and nautical shapes. Some vintage markings are popular like those of the J-boats, where some others are so rare, that we may only ever see one of its kind in our shop. 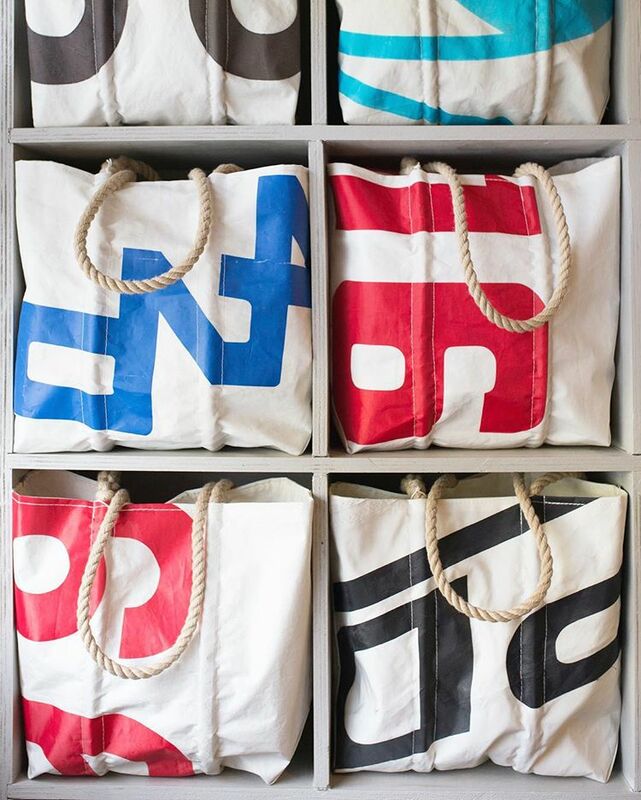 Recycled into handcrafted totes and accessories at our shop in Portland, Maine, these durable products are machine washable. Because each sail is cut and handcrafted into the finished product, every Vintage bag is unique and irreplaceable. 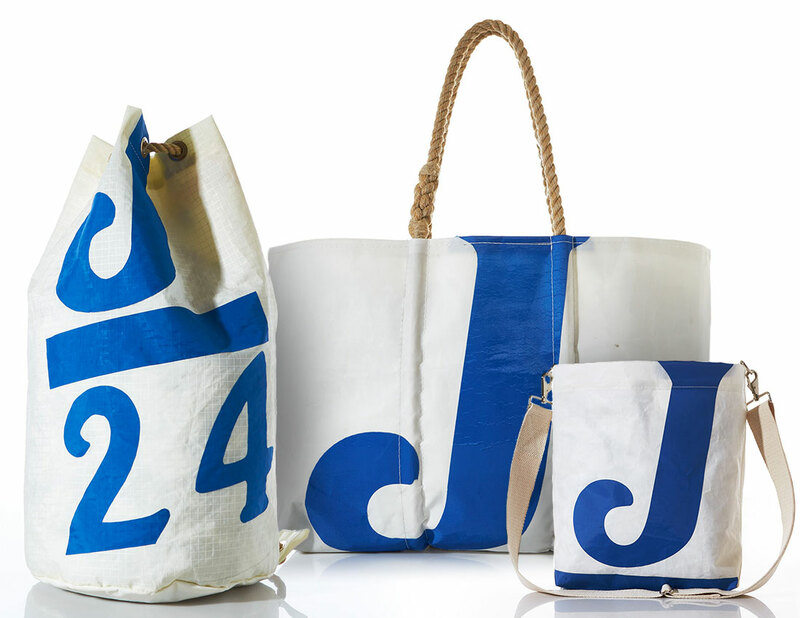 The rarest Vintage Inisgnia bags are featured in our Sea Bags Auctions. Truly one-of-a-kind, we're always hesitant to see them go and often reminisce about our favorites. These bags go to the highest bidder. The J/24 class is one of the most popular racing classes for amatuers and seasoned professionals alike. It was created to fulfill the diverse needs of recreational sailors such as cruising, one design racing, day sailing, and handicap racing. The class has more than 50,000 people sailing 5,300 boats worldwide and is still considered the "gold standard" for modern one-design keelboats around the world. 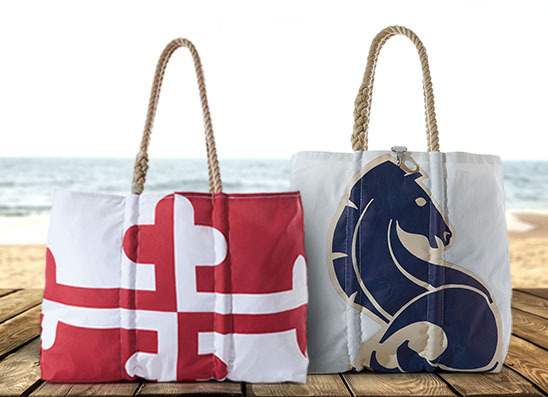 "The designers at Sea Bags went above and beyond to create a one of kind Bag for the perfect custom Christmas gift. If you don't know yet, you should. Thank you so much! My wife was thrilled and ecstatic about her personalized bag of our precious and beloved dog Rudy. And the paw print on the opposite site was the icing on the cake! Priceless!” - JEFFREY P.
We acquire new sails every day and never know what will come through the shop. Never miss an opportunity to buy YOUR special bag by signing up for email updates, PLUS Save 10% by signing up! How do we get all these great sails? Every sail has a journey and we make sure that story never ends. Experience the life of one particular sail, the Satana 22, from its donor Ben Ford.